Trying to write the summary of Fallout, I was struggling to say much that didn’t include spoilers so I’ve decided instead to go with including the blurb below rather than trying to write something myself (a cheat I know but it seemed the better option, plus it really does sum up the book better than I can). Leaving behind an emotionally disastrous childhood in a provincial northern town, budding playwright Luke Kanowski begins a new life in London that includes Paul Driscoll, an aspiring producer who will become his best friend, and Leigh Radley, Paul’s girlfriend. Talented and ambitious, the trio found a small theater company that enjoys unexpected early success. Then, one fateful evening, Luke meets Nina Jacobs, a dynamic and emotionally damaged actress he cannot forget, even after she drifts into a marriage with a manipulative theater producer. As Luke becomes a highly sought after playwright, he stumbles in love, caught in two triangles where love requited and unrequited, friendship, and art will clash with terrible consequences for all involved. The only thing that doesn’t fit here is the terrible consequences because, in the end, things didn’t seem to end too badly for most of the characters, although they might not have ended up where they expected or wanted to be. Then again, they are all in their early twenties so why should their lives be quite so mapped out? That’s what I thought I might be getting at the beginning, a story with a perfect happy ending, and then the book took some twists and turns and ended up in a different place, which was fine with me. Along the way, I came to like all the characters but Nina, who I felt the opposite about. I found her shallow, self-centred and flat. With Luke, Leigh, and Paul, however, I thought Sadie Jones did a really good job of making them real, filling in enough of their back story to explain their actions but not so much that it dragged the book down. Given Fallout was very much about emotions and how they lead each individual to make some pretty bad choices, this could easily have happened. 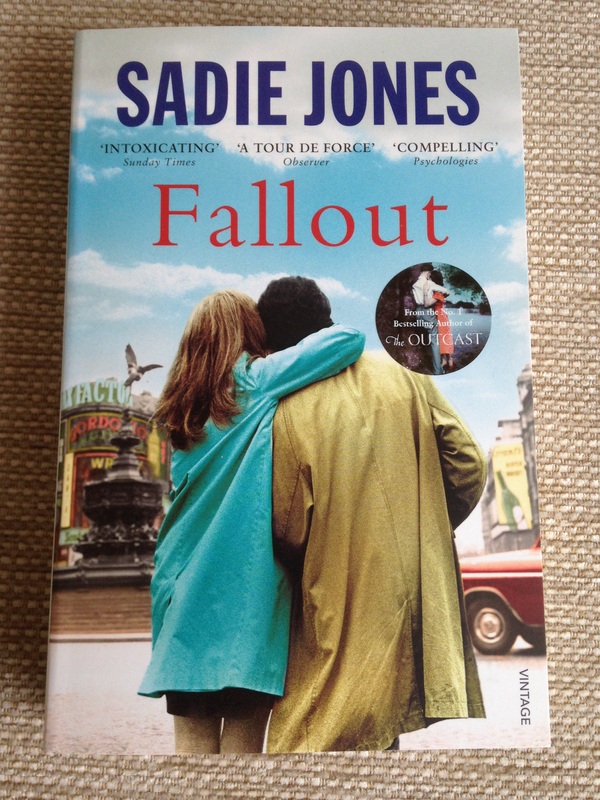 I’ve said in previous posts that I like Sadie Jones’ writing style and this was the case here. It’s descriptive and detailed without being boring and gave Fallout a good pace that kept me turning the pages. Setting the story in the 70’s, a time of change, and the world of theatre, worked well as it allowed characters to be a little off-centre and their more extreme behaviours seemed less extreme as a result – though I still couldn’t forgive Nina her behaviour. She was the one weak link for me because there was nothing redeeming about her. But that wouldn’t stop me recommending the book because I liked it a lot! Note: I received this book in return for a fair and honest review all opinions are my own. Thank you. I liked The Outcast a lot so hope you do too. Enjoy!